Musicians aren’t the only entertainers who like to flex their performing muscles; actors occasionally can’t resist the lure of regular MTV rotation. That was the trend for a while during the 1980s, anyway. Most of the title songs from films that hit the Top 40 were turned into music videos simply by splicing together a hodgepodge of clips from the movie, but there were some actors who took the trouble to actually appear in the accompanying videos. Whether it was a chance to ham it up with their favorite singers or because the studio ordered them to participate, the results were usually more interesting than the standard collection of movie clips. 1. “GHOSTBUSTERS” (1984) // RAY PARKER JR.
Ray Parker Jr. was not particularly interested in writing/recording the theme song for Ghostbusters; his forte was songs about romance, not the paranormal. So he was even less enthusiastic about appearing in the video for the song. When he saw the sparse set outlined in neon, he worried that he was going to look silly prancing around while miming the lyrics. So he suggested to director Ivan Reitman that maybe if he could get some of the guys from the movie to appear in the video, even if just long enough to shout “Ghostbusters!,” the audience would understand that the clip was supposed to be humorous. Reitman liked the idea and ran with it, popping a cassette of the tune into a boombox and calling on various industry friends (or actors who happened to be working nearby, such as John Candy on the set of Brewster’s Millions), with a small camera crew in tow. George Wendt, like the other cameo actors, did not get paid for his appearance, which later got him into hot water with the Screen Actors Guild and set the wheels in motion for SAG to begin organizing the music video industry. David Foster, the record producer in charge of the soundtrack of the 1985 Brat Pack angst-filled film St. Elmo’s Fire, approached British singer/songwriter John Parr with the idea of writing a theme song for the movie. Interestingly enough, Foster didn’t provide Parr with any scenes from the movie; instead he showed him some film footage of Canadian Paralympian Rick Hansen who, inspired by fellow Canadian Terry Fox’s “Marathon of Hope,” launched a 26-month “Man in Motion” trek across 34 countries on four continents in his wheelchair. John Landis directed both the film and the music video for the title song of Spies Like Us. Chevy Chase and Dan Aykroyd traveled to London to lark about Abbey Road Studios with Sir Paul McCartney. The U.K. refused to air the video until it was reedited to remove scenes of Chase “playing” the keyboard and Donna Dixon and Vanessa Angel singing backup, because they were not members of the Musicians Union. Nevertheless, she filmed a long-form, two-part video for the song, which featured not only members of the movie’s cast but also several WWF stars like Rowdy Roddy Piper, Captain Lou Albano, and André the Giant. “We were spaced out because it was Saturday after a long week,” Sean Astin recalled, “but we flipping loved that song and wanted to do lots of vids with the Great Cyndi Lauper!" Queen was commissioned to provide the soundtrack to the 1986 film Highlander, and “Princes of the Universe” (which was played over the main titles) was the only track on the album to be credited solely to Freddie Mercury. The video that accompanied the song was directed by Russell Mulcahy, who also helmed Highlander, and was filmed at London’s Elstree Studios. There was great attention to detail (not to mention expense) on the set when it came to recreating the Silvercup rooftop scene with scenes of the medieval crumbling castle in the background. Brian May, John Deacon, and Roger Taylor were dutifully clad in official Connor MacLeod trench coats (“Macs” to U.K. readers) for the occasion. Highlander star Christopher Lambert flew in from Paris just to film a quick “sword battle” with Mercury for the video. Lambert told Entertainment Tonight that he totally enjoyed the experience; that it was like being witness to a private Queen concert. “Sweet Freedom” wasn’t technically the theme song to Running Scared, the 1986 buddy cop film starring Billy Crystal and Gregory Hines; that honor belongs to Fee Waybill’s “Running Scared,” which played over the opening credits. But the lead singer of The Tubes didn’t have the Top 40 marquee value of Michael McDonald, who’d fronted the Doobie Brothers for seven years and had several top 10 hits under his belt. “Sweet Freedom” was produced by Rod Temperton, who wrote Michael Jackson’s hit “Thriller,” and was heavy with the percussive synth-bass that was the 1980s movie backdrop “sound.” Crystal and Hines joined McDonald to “sing” along on the chorus, luckily in more toned-down plumage than they sported in the film during this Key West musical montage. 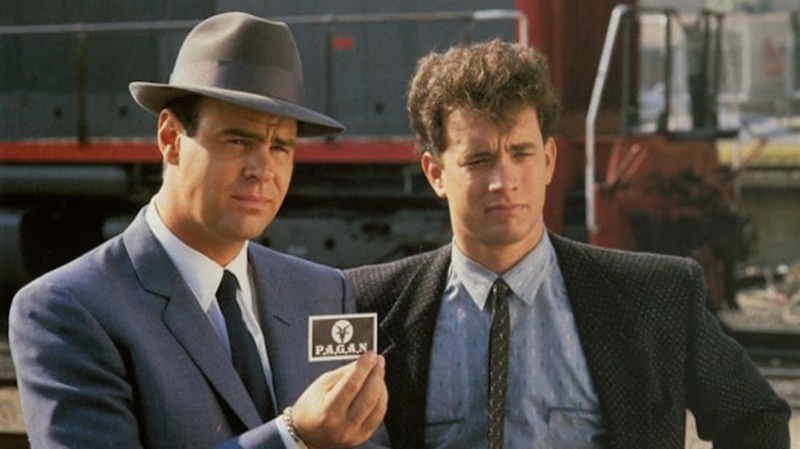 Dan Aykroyd and Tom Hanks aren’t known for being singers, much less rappers, but they gamely recorded the closing theme for their 1987 big-screen version of Dragnet. Paula Abdul devised the choreography for the music video, recycling some of the moves she taught ZZ Top for their “Velcro Fly” video. During a 2015 appearance on The Graham Norton Show, Hanks busted a few rhymes from the song “that will haunt him for the rest of his life” and also revealed that “City of Crime” was the first video he ever saw on YouTube—courtesy of his children, who couldn’t wait to taunt him with it.